Planning for spring break or for bikini season? Feel sluggish and off-schedule due to Daylight Savings Time? Want a healthy energy boost without the sugar, the long lines at the coffee shop, or the concerned stares of your friends and colleagues? The Energy Drink of the Month for March 2014 is FRS Healthy Energy Citrus Pomegranate. Other flavors are available, but I don’t like to drink my calories so I prefer the Low Cal option. Furthermore, I’m happy with the coincidental pomegranate theme I’ve got going on right now (see the picks for January and February). Like the picks for January and February, this is another product that doesn’t quite fit the image of an energy drink. When most people hear “energy drink”, they think of the Big Three, but more and more “alternative energy” products like this one are cropping up. This product is a healthy swap for someone who wants an energy drink without the health and safety concerns surrounding the more popular brands. Ignore the blanket statements in news headlines and remember not all energy drinks are created equal. Quercetin is an antioxidant and a powerful anti-inflammatory in animal studies. In human studies, proving Quercetin works is as tricky as answering why Lilly Potter has different color eyes than her son in Deathly Hallows Part Two. Lack of sleep, poor diet, stress and smoking habits are just some of the factors that affect inflammation. When there’s no difference between the placebo group and the Quercetin group in human studies, it’s hard to tell whether Quercetin is doing nothing or whether it’s just not doing enough to overpower all the other factors. Quercetin has been studied for its potential to improve exercise endurance and recovery. While some studies do show a benefit, others do not, and for specific reasons. To learn more about these specific reasons and how you can put yourself in the “It Worked For Me” camp, see the Quercetin section of Are You a Monster or a Rock Star: A Guide to Energy Drinks – How They Work, Why They Work, How to Use Them Safely. “There is increasing concern that consumption of free sugars, particularly in the form of sugar-sweetened beverages, may result in both reduced intake of foods containing more nutritionally adequate calories and an increase in total caloric intake, leading to an unhealthy diet, weight gain and increased risk of noncommunicable diseases (NCDs),” the WHO said in its draft. “Sugars in question” include fruit juices, but these juices are sometimes preferred by consumers over plain sugar, fructose or HFCS. In FRS Healthy Energy Citrus Pomegranate, the second ingredient is White Grape Juice Concentrate, which is fairly sweet. For other fruit juices commonly used for their sweetness, see January’s Energy Drink of the Month. With only two grams of sugar per serving and an equal amount of fiber per serving, this sweetener system is what makes this energy drink stand apart from some of the others. 2.Logos for Brand Image – With the evolution in social media it’s become more important for brands to take on a personality, one you’d “Like” and consider your friend. FRS takes pride in supporting Team Livestrong, and this logo helps them portray their values to consumers. Also, I can’t remember the last time I saw “Please Recycle” so prominently near the Facts Panel. Perhaps this is coincidental, or perhaps it’s a subliminal cue to think of FRS as environmentally friendly. 3.Shake Well – This is obviously not a carbonated beverage. That’s good news if you’re thinking of using this as a pre-workout supplement because carbonation can irritate the stomach during a workout. 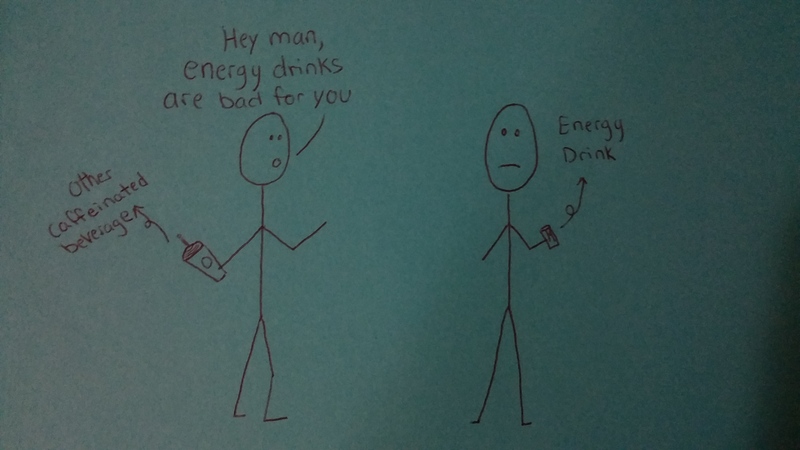 This irritation is one reason carbonated energy drinks feel more potent than their non-carbonated counterparts. The irritation speeds up absorption of certain nutrients, such as caffeine, through the stomach lining. 4.Refrigerate after opening – This is a clue that it’s okay not to finish the whole product in one sitting. It’s okay to save the rest for later; it’s not like it’s going to go flat. I personally admire this instruction because it’s a pet peeve when people chug caffeinated products. See this poorly designed study from the American Heart Association: “Duh-Alert”. 5-7.No artificial flavors, colors or preservatives; Gluten Free, Non-GMO – Hitting all the big consumer favorites. While the FDA is in the process of updating Food Label formats, (like this) consumers are getting pickier about what they do and don’t want to see on a label. For the first time, “non-GM” claims overpower “Organic” claims as a driver for consumer decisions (see this PR Newswire article). Furthermore, as consumers become more aware of the lack of meaning behind the word “Natural”, their desire to see “No (this/that)” claims increases. 8.Contains 3% Fruit Juice – Some energy drinks may irritate the stomach but those with fruit juice are less likely to do so. Ever feel queasy after consuming a multivitamin on an empty stomach? Some ingredients work better/are better absorbed when taken with food. 9.Supplement Facts – Some caffeinated products are supplements and some are beverages. Each category has its own rules. For details on the implications of marketing as a beverages vs a supplement, see previous post. 10.Serving Size – 1 Can. Certain products are prone to being consumed whole, regardless of how many servings the label indicates (see “I Ate the Whole Thing”). I appreciate when the Servings per Container matches actual consumption habits, especially for caffeinated products. There is a very small amount of caffeine in this product (38mg per can – Caffeine Informer). This product might serve well for consumers at the threshold between Fatigue Level 1, (fatigue due to boredom or dehydration) and Fatigue Level 2 (fatigue that calls for a teeny boost, not a high-powered shove). For more on the 5 Levels of Fatigue, consult the Energy Drink Guide. Not all energy drinks are created equal, and this product demonstrates why. 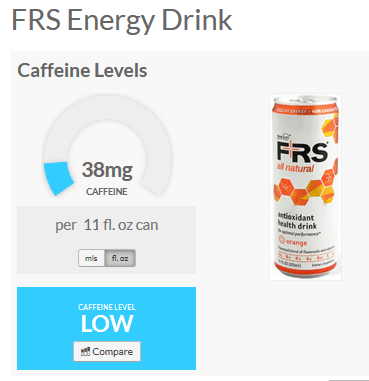 While water and green tea trump all as the healthiest beverages on the planet, FRS Healthy Energy is another example of a healthy alternative to the stereotypical energy drink. When looking for other beverage options, HYDRIVE Energy Water is a great low-calorie choice. At only 30 calories, HYDRIVE Energy Water provides an alternative to drinking cups of coffee throughout the workday and is designed with formulas to provide benefits such as focus, extra power, and recovery. HYDRIVE Energy Water combines the light, refreshing taste of a vitamin water with the boost of caffeine from an energy beverage. I’m always cautious to promote caffeinated waters because of how much water people should consume in a day versus how much caffeine people should consume in a day. Nonetheless, thank you for the head’s up about this interesting product.